Now a days Facebook is working on some interesting features, to provide better and quality service to their users. In their Android Facebook Messenger App, Facebook included a feature which will support users to have multiple accounts in Messenger App. Before this update If you want to login with different account in Facebook messenger App for Android you need to logout of the present account and login with the other account. With the help of this update, in a single device you can login to two or more Facebook accounts and easily switch between these accounts easily. In the Facebook Messenger App for Android, on the right side top corner you can find the settings option. Click on settings option. Then you will be navigated to a screen where you can find list of options. In that select "Accounts" option. Next, click on the plus "+" icon which is on the top right corner of the screen. Then a pop screen will be displayed asking the user to enter the other account "Email or Phone Number" and "Password". Enter the credentials then select the button "Add". That's all you need to do to add another account in the Facebook Messenger App for Android. Then you play around with different accounts in the single device. While entering the other account credentials, you can see a small check box asking the user "Require a password when switching to this account". You can check that box or not, it is based on your interest. This is simple, and similar to the process of adding the other account in the messenger app. Select Settings option on the top right corner and then select the Accounts option. It will display the list of accounts that are in Messenger App. You can select your desired account. This is good feature from Facebook like Google. In google mail you can switch between accounts easily. 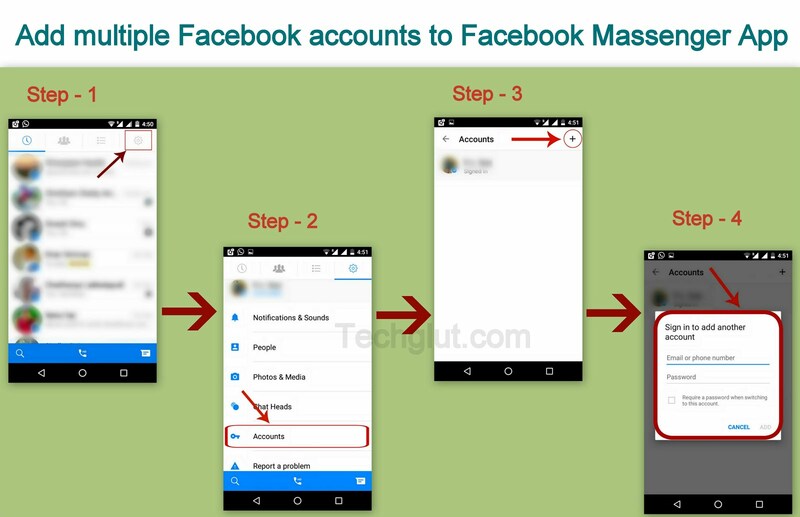 That's how you can add and manage different accounts in Facebook App for Android.